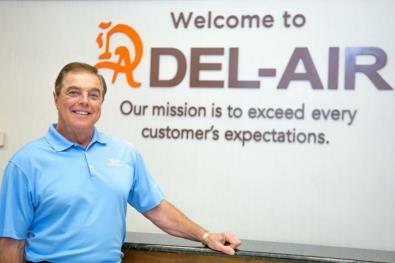 Welcome to Del-Air, the Largest Heating and AC Company in Orlando! I founded Del-Air Heating and Air Conditioning in 1983 with an unyielding pledge to provide consumers, builders, and commercial clients with exceptional customer service. Del-Air has since become the largest residential heating and air conditioning company in Florida by upholding our mission to exceed every customer’s expectations. Our commitment to providing exceptional customer service starts with having over 400 fully stocked trucks staffed with expertly trained, manufacturer-certified technicians. We sell and service every major air conditioning brand at the best prices, delivered and installed on time. We are committed to giving our customers a quote within 10 minutes and installation the next day. We provide 24/7 service and never charge an overtime fee. We currently operate throughout most of Florida with locations in Sanford, Kissimmee, Clermont, Melbourne, Tampa, Jacksonville, Fort Myers, and Bradenton, to conveniently serve you. As Del-Air has grown and developed, our commitment to exceptional customer service has continued. As of January 1, 2016, Del-Air Heating and Air Conditioning became a 100% employee-owned company so now every person you deal with at Del-Air is an owner. We will continue to build on the core principles that I have used to guide the business which are to always do quality work and commit to 100% customer satisfaction. The Del-Air team is devoted to enhancing our capabilities to better serve our customers. At Del-Air, customers can communicate what they want, when they want it, by a variety of means (phone, email, on our website, social media, etc. ), and they can pay for it from a list of options that best fit their circumstances. 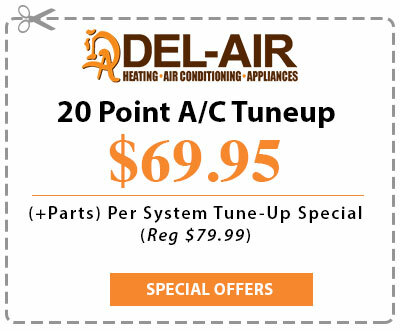 Please browse through our website or call us at (844) 574-4578 to get more information about Del-Air and how we can best serve you. We want to thank you in advance for showing interest in our services and our company.